Expect Miracles Foundation directs its funding for cancer research to two collaborative research centers which share the goal of providing hope for patients by accelerating the pace of translating scientific discoveries into new therapies. Expect Miracles Foundation is a major supporter of the heart of Dana-Farber Cancer Institute’s revolutionary research and development model, the Robert and Renée Belfer Center for Applied Cancer Science. 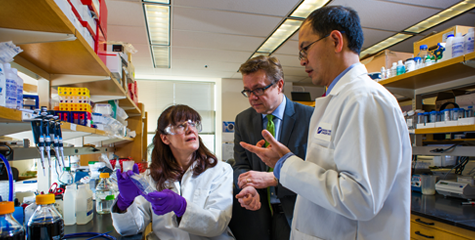 The Belfer Center addresses key challenges in cancer treatments by leveraging DFCI discoveries and applying them to drug discovery and development. The Belfer Center is focused on identifying strategies to overcome resistance to existing treatments. Using a collaborative research approach that brings together resources from academia and the biomedical industry, the Belfer Center is leading the way in translating today's science into tomorrow's targeted therapies more quickly than ever, bringing new hope to cancer patients. “Expect Miracles Foundation’s support has enabled us to move in directions that we couldn’t before.” – Pasi Jänne, MD, PhD, scientific director of the Belfer Center. Reprinted with permission from Dana-Farber Cancer Institute. To learn more, visit www.dana-farber.org. The Expect Miracles in Manhattan event supports the groundbreaking research at Memorial Sloan Kettering Cancer Center’s Center for Experimental Therapeutics, a critical research collaborative with the mission of hastening the time it takes to get new, more effective and less toxic therapies to cancer patients.